Today I'm headed to Mississippi with my wonderful husband, Justin, and our two friends. I'm super excited to go because I get to see family, have fun with Justin and friends, and go to Destin on tomorrow! So of course you can catch me soaking up the sun, lathered in oil, relaxing on the beach, and enjoying the sound of waves at any given moment. Ha! I wish. It's supposed to rain the whole trip. Womp, womp, womp… but thankfully I do get to enjoy spending time with a few people that mean a lot to me and keep me motivated daily. Pack healthy snacks! I know this is easier said than done, but I promise you will feel less guilty on the way to and from wherever you're headed. I'm a sucker for Goldfish, but I know that it's best to stay away from processed food. I'm not going to pack the whole bag I bought, but instead I'm going to pack two of the serving sizes that is labeled on the back into two separate baggies. Let me also mention that I bought the Goldfish made with whole wheat. It's healthier, not gluten free (which I also know to eat them sparingly because they will upset my stomach if I have too many), but they're healthier than the regular cheesy good stuff. We are also bringing some baked chips (I made sure to grab a bag of gluten free ones for me). I'm more of a salty craver, so these shall do. And last but not least, the mother load of all sweet snacks. Delicious, cold, juicy fruit! Okay, okay so it's not candy or ice-cream, but it's full of amazing nutrients, vitamins, and energy! It's perfect for your body. Go to the grocery store, go to the produce section, buy whatever fruit you want, bring it home, and prepare it. 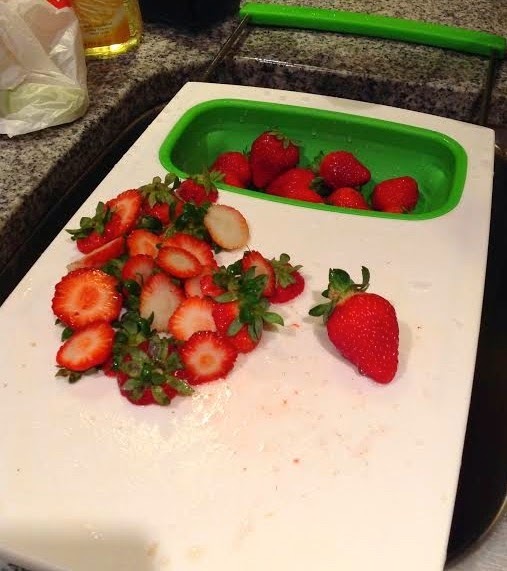 What I mean by preparing it: wash it, cut it, store it, put it in your diet. 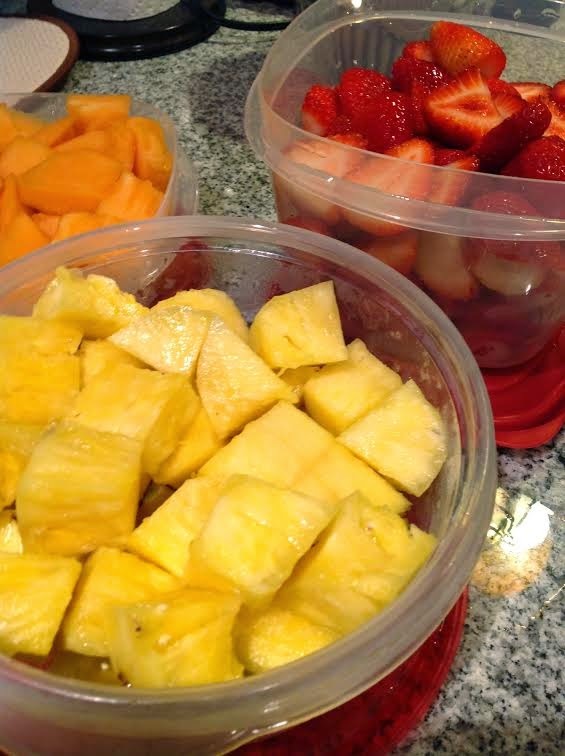 Tip #1: I used to buy the kind of fresh fruit where it's pre-cut and it's in those little tubs, but I found that they were actually more expensive (I'm assuming due to labor), so I started buying a whole pineapple, cantaloupe, watermelon, etc. and cut it myself. It took a little practice to cut the pineapple but I've got it down now and I actually get way more than the pre-cut kind! Tip #2: Always prepare your meals, preferably right after you go to the grocery store. I know it's not the first thing you want to do after unloading all of the groceries, but you'll be more likely to stay on track with your goals. Check out all of that fruit! That's a large carton of strawberries, one cantaloupe, and one pineapple. Yum! Oh and I love my over the sink cutting board. If you're wondering what kind of fruit I eat, I prefer strawberries (berries are some of the best for you because they are filled with antioxidants), bananas, pineapple, cantaloupe, nectarines, and watermelon. Honestly, I used to hate fruit. I really didn't start liking it until I changed my eating habits. I gained the mindset that I didn't want to give up sugar, so fruit was the only true healthy option. Fruit is so powerful and good for you. Once I started eating it in replace of cookies and candy, I really started to enjoy it more. 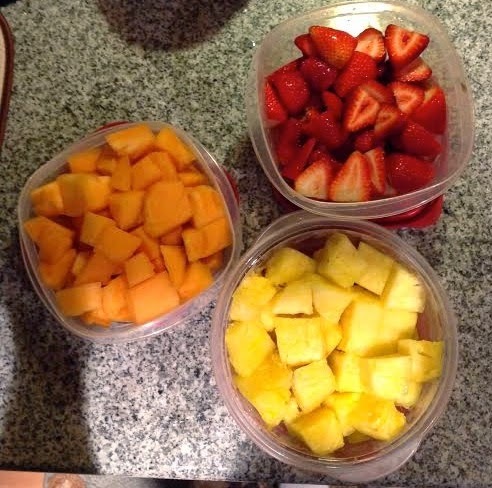 Don't get me wrong, I love fruit but I don't eat it in every meal. Daily, I usually eat it with breakfast and have some as a snack. Cool thing: There's a really cool App that shows you the vitamins and benefits you can get from fruits and vegetables. It's called Wholesome. It's pretty cool! I'm a person that lacks iron, so I saw on Wholesome that edamame is a good source of iron. Who knew?! Yum! Here's a good tip to know if you are hungry or just "bored hungry." Have a piece of fruit (or veggie of course!). If you actually eat it, you're stomach is actually hungry. If you try it and decide you don't want it, your brain is probably just telling you you're "bored hungry", so in that case just drink 1-2 cups of water (8-16 ounces). Your body is most likely just telling you that you're thirsty! Remember to always drink your water throughout the day. You will feel fuller longer and be less hungry. Always try and drink 1-2 cups before and after you eat, and when you wake up and go to bed. It helps your stomach and the digestive system. Alright! There's my word vomit for the day. I hope you enjoy! Remember, any questions/comments/suggestions, don't hesitate to bug me! I really do appreciate all of your sweet comments and support on Facebook. You guys are amazing! P.S. Look for my next post when we return. We will be gone for four days! Everyone have a great weekend! Keep drinking your water and add some fruit into your diet.